Excellent base for mountain biking, walking, sightseeing. Pepper House offers two guest bedrooms – a standard double and a super-king double – all with modern shower, WC and handbasin facilities. 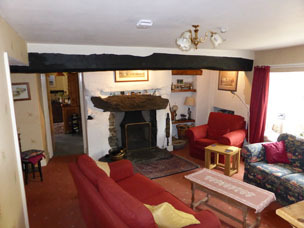 All rooms are centrally-heated, and have hairdryers and tea/coffee making facilities. 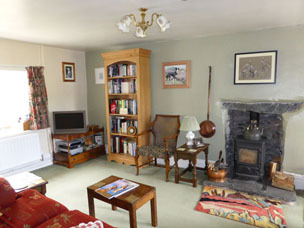 There are plenty of books in all the rooms, and guests are most welcome to borrow them. Hi-speed wi-fi is available in all rooms. Downstairs are two comfortable lounges, one with television, and both with real fires in cooler weather. The dining room has one large table around which we all sit, so guests can enjoy convivial conversation over breakfast, or merely gaze at the wonderful view over the valley. Outside are terraces all around the house, overlooking the gardens, orchard and paddock in which we often have pet lambs. There are tables and chairs in various locations which guests are welcome to use. In the farmhouse tradition, we serve generous home-cooked meals, including home-baked bread and local produce (some garden grown) where possible. The breakfast bar offers a range of cereals, juices, yoghourts and fruit, to be followed by a full cooked English breakfast. We do have a residents’ drinks licence, so can offer our guests a good range of wines and spirits. Afternoon tea with home-made cakes is often available, as are packed lunches. Pepper House is a totally no-smoking establishment and we do not take dogs, nor children under eight years of age.